“The best movie I’ve ever seen, ever”. This comment by a 11-year-old boy attests to the fact that this edition of a comic book superhero hits the mark with the target demographic profile. 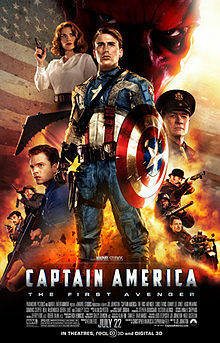 For the rest of us this tedious World War II action drama overstays its welcome by at least 30 minutes, is too repetitive (the fight scenes go on forever) and has no redeeming values apart from great CGI work. At the risk of giving away the ending the only thing I’ll say is it’s the wimpiest grand finale of any action movie I’ve ever seen. Totally out of context to the rest of the story and a real cop out given that there are several better endings if they had only given it some thought instead of calling it a day and leaving things hanging like that. During World War II the 4-F classification was assigned to registrants having severe physical problems, mental deficiency and/or syphilis. Steve had none of these: his medical conditions were limiting but not disabling so he would have been classified as 1-Y and therefore available for military service when he first applied.